I consider this costume to be, basically, a disaster. The mask was very heavy (the kind of papier mache I used was different than before), and I couldn't see out of it very well. 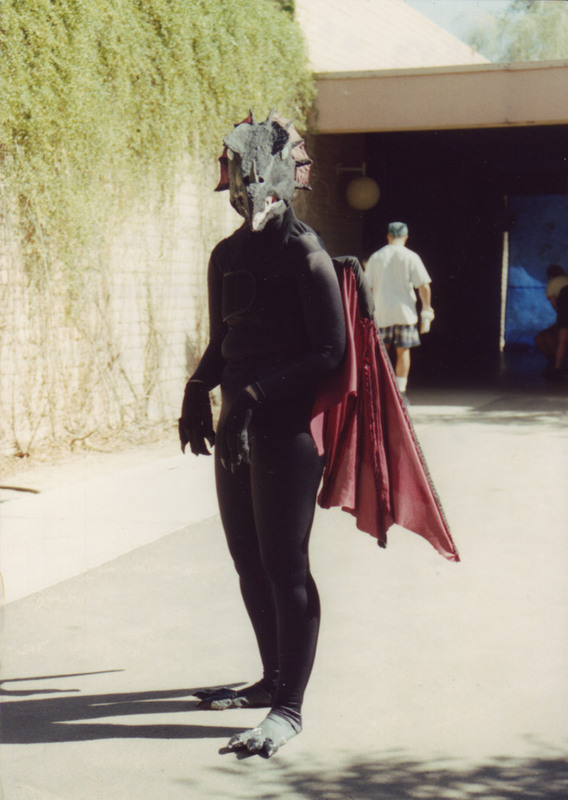 The ventilation was poor, and the entire costume was black, which is a bad idea especially in Arizona, where the October temperatures still feel like summer. The overall look of the costume just wasn't pleasing; the mask was poorly planned, and had a clunky, unrealistic look. Making claws out of ceramic is a bad idea. Making big claws out of ceramic is about the worst idea possible. Where I might've gotten away with small ceramic claws, the ones on this were horribly oversized, heavy, clinked when I walked, and chipped very easily. And the worst mistake was that I started on this costume way too late in the year. Even the mistakes I did notice, it was too late to correct. A couple of things weren't too bad on this one, though. Aside from a great education in what not to do on future costumes... The ceramic teeth worked well; I went on to use those in future costumes. 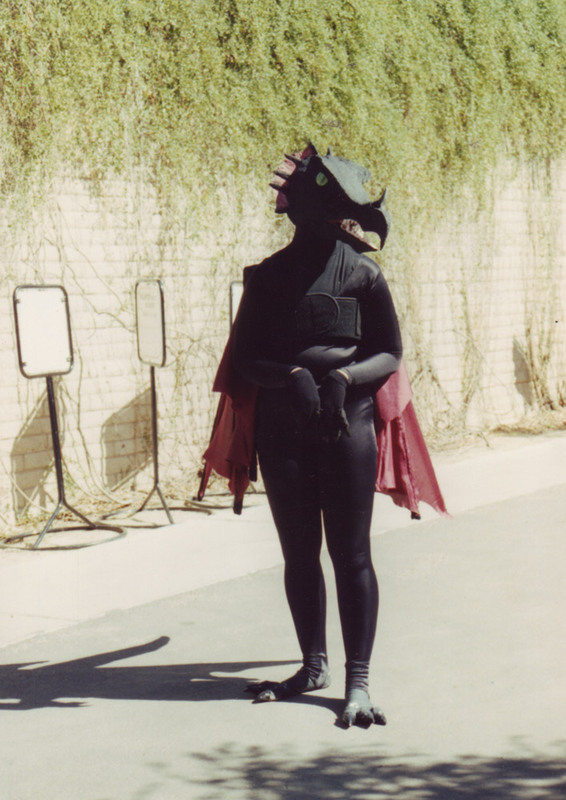 The eyes, as well, were neat; they were the same half-dome plastic things as in my raptor mask, but left clear. A three-dimensional slitted pupil, placed inside, made it appear that the eye was looking at you no matter where you viewed it from. 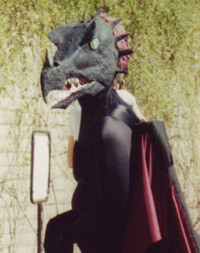 I dismantled this mask, but kept the eyes intact to use in my red dragon costume, later on. 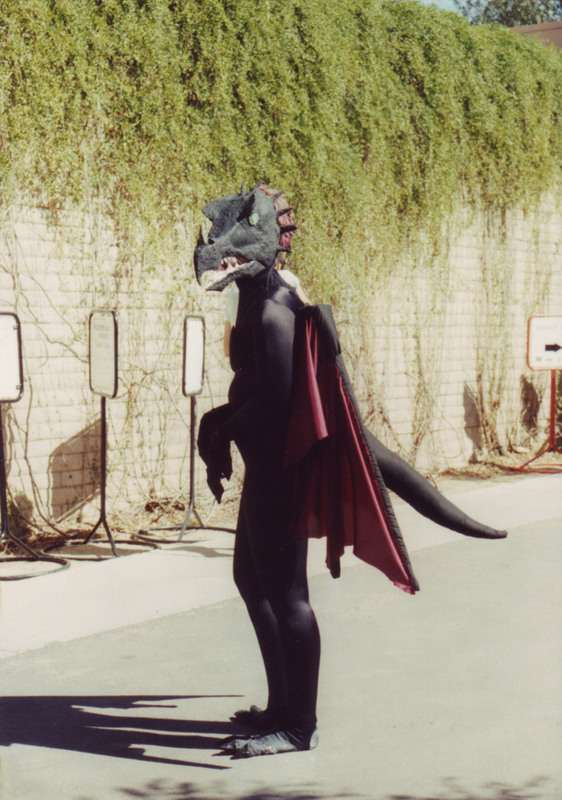 All in all, this costume was horribly uncomfortable, and not too great of an experience. But my love of costuming perservered. I decided that, instead of letting this costume sour me to the art form, I should learn from the mistakes I made on this one, and go on to create better ones.